While it was never their goal, Bluebird Gardens has grown to be the biggest CSA (Community Supported Agriculture) in the Midwest. A CSA is a membership based organization where the members receive a share of the farm’s bounty each season. Those shares come in the form of basket of fresh produce each week throughout the growing season (about 20 weeks from June through October in the case of Bluebird). In addition to the 150 acres they planted in past seasons, Owner/farmer Mark Boen tells us that they are adding 108 acres to the farm this summer that will them to grow cover crops that further improve the soil…and the nutritional density of their produce. Their goal is to connect people to the farm where their food is grown and part of their efforts to do that are the member harvest events that are an added benefit unique to their CSA. Boen tell us “you can be organic and still grow empty food” if the soil doesn’t have the right biology. He is very pleased with the number of businesses that are making Bluebird Gardens part of their employee wellness programs. To contact Bluebird Gardens, call 218-205-4739, find them on Facebook, or visit them on the web at www.bluebirdgardens.net. 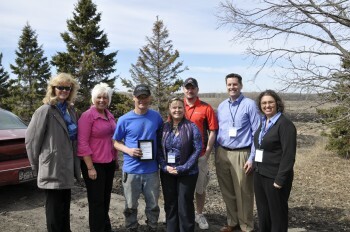 Pictured from left to right: Brenda Hauschild (Eggen Group Marketing), Karin Storm (Bell State Bank), Mark Boen (Bluebird Gardens), Lisa Workman (Fergus Falls Area Chamber of Commerce), Chad Brown (C&K Design Group), Joe Branca (Ameriprise Financial) and Jennifer Rogholt (Village Cooperative). The Victor Lundeen Company opened their doors on April 10th, 1914. One hundred years later they are still family-owned and going strong. Before landing at their current location in December of 1919, the business occupied a handful of downtown locations as they continued to grow. The printing presses still occupy the upper level while the digital printing services, office supplies, promotional products, gifts, cards, books and decorative items occupy the main level. In 1980, when a bank left the space next door, the Lundeen’s opened up a portion of the brick wall between the spaces and expanded their business once again. Buzz Lundeen tells us that the business has employed over 500 people over the last one hundred years. Today, they have a staff of 25-30. Many of their employees have 20-25 years of service. Longevity seems to be the order of the day at Lundeens. Lundeen notes that computers are the biggest game changer for their business, and son Paul Lundeen, who joined the business in 1993, is at the helm of changes in their technology. The staff is gearing up for their official Anniversary celebration taking place the last week of April. You can reach them at 218-736-5433 during business hours Monday thru Wednesday 8 to 5:30, Thursdays 8 to 7, Fridays 8 to 5:30 and Saturdays 9 to 5. You can email them at Lundeens@prtel.com or find them online at www.victorlundeens.com or stop by their store at 126 West Lincoln Avenue in historic downtown Fergus Falls. 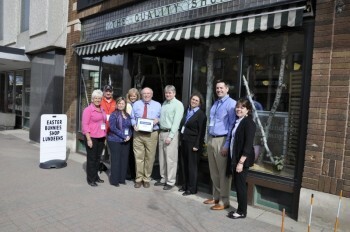 Pictured from left to right: Karin Storm (Bell State Bank), Chad Brown (C&K Design Group), Lisa Workman (Fergus Falls Area Chamber of Commerce), Becky Hauschild (Eggen Group Marketing), Buzz Lundeen and Paul Lundeen (both of Victor Lundeen Company), Jennifer Rogholt (Village Cooperative), Joe Branca (Ameriprise Financial) and Mary Petit (Keller Williams). Members of the Chamber’s Ambassador Team welcomed Sue and Dan as new members of the Chamber and stopped by their new location for a visit and tour. The Mohagen team works with both buyers and sellers; specializing in residential and lakeshore property. You can reach them at smohagen@hotmail.com or danmohagen@hotmail.com, by cell at 218-731-7376 or 218-205-7222, find them online at www.mohagenrealestate.com or stop by the office. Pictured from left to right (back row): Jennifer Rogholt (Village Cooperative), Lisa Workman (Fergus Falls Chamber of Commerce), Karin Storm (Bell State Bank), Mary Pettit (Keller Williams), Joe Branca (Ameriprise Financial), Chad Brown (C&K Design Group), Becky Hauschild (Eggen Group Marketing), (front row): Sue Mohagen and Dan Mohagen (Mohagen Real Estate). Paydac Plastics Inc. moved their operations to a new home at 1928 W. Fir Ave. and members of the Chamber’s Ambassador Team were there to help cut the ribbon. President Phil Johnson, Vice President Teresa Johnson and the Paydac staff are all smiles. They have doubled their workspace and have made improvements to the electrical system and renovated the office spaces. Their Open House was held on April 24th and offered an opportunity to see custom plastic injection molding in action. The floor was open to the public as Paydac staff answered questions and gave mini tours of the process. In this impressive new space Paydac is able to have multiple jobs running at one time; something that was more of a challenge in their previous space. The professionalism, focus on detail and great attitude is obvious to anyone who walks in the door at Paydac. We can certainly see why their client list continues to grow. You can reach them via email @ ppaydac@prtel.com or via phone at 218-998-5040. 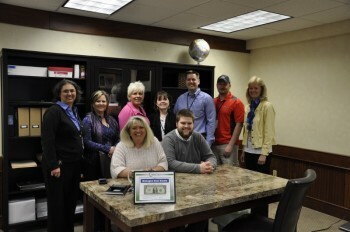 Pictured from left to right: Sue Wilken (A Place to Belong), Michelle Pearson (Keller Williams), Chad Brown (C&K Design), Arlinda Tollefson (Paydac), Renee Lemke (Security State Bank), Dean Hanneman (Paydac), Teresa Johnson (Paydac), Dale Umlauf (West Central Initiative), Phil Johnson (Paydac), Boyd Schleske (Paydac), Bonnie Kunz (Paydac), Mayor Hal Leland (City of Fergus Falls), Lisa Workman (Fergus Falls Chamber of Commerce). 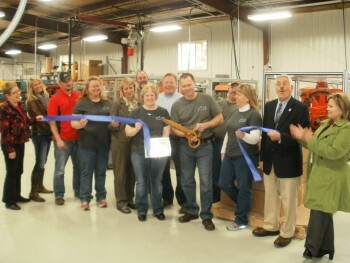 A ribbon cutting took place at the April 2nd Grand Opening of Wallwork Truck Center's new Fergus Falls location. The center recently relocated to a newly renovated 6,000 square foot facility that allows them to continue to provide the excellent parts support they are known for, along with added room for future growth. Members of the Chamber's Ambassador Team were on hand for the event. A catered lunch for Wallwork's customers and invited guests was served after the ribbon was cut. Nearly 150 people were in attendance. 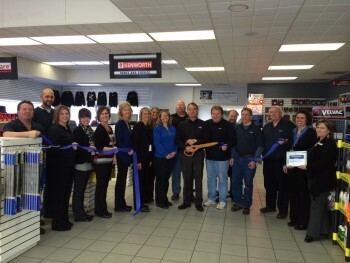 Wallwork Truck Center has been serving Fergus Falls with a parts only store since 2006. Many area Kenworth and Ford truck customers area shop Wallwork Truck Center for their heavy and medium duty truck part needs. Wallwork Truck Center continues to provide a dedicated parts sales staff for new and used Kenworth and Ford truck lines for medium duty, heavy duty, commercial, cab and chassis, conventional, sleeper trucks or day cabs. Stop by their new location at 712 Frontier Drive or call 218-998-3297 (or 866-998-3298 toll free). They are open Monday through Friday from 7:30am to 5:30pm. Or find them online at www.wallworktrucks.com or on Facebook.